If you have great shirts, you need to know how to pick neckties that will make both the shirt and tie pop to their best advantage. For the most part, it's easy - just a basic understanding of colors and fabrics plus common sense will help you look your best every time. When in doubt, a white shirt goes with everything. In the 1960s-set show Mad Men, the lead character only wears plain white shirts and dark ties to match his gray suits. It was part of the conformist nature of the 1950s and early 60s, but it also looked good wherever he went. Any tie will also go with a black shirt, which can make dressing for an evening event simple. If you have no idea how to pick neckties and don't want to fuss, pair them with nothing but white or black shirts. For the man who likes a bit more fashion in his look, it's important to know how to pick and choose a necktie that works with colored or patterned shirts, or a shirt worn with a waistcoat. The general rule is to work from the largest piece of clothing to the smallest. So you pick the suit, then the shirt that matches, then the tie. If the suit and shirt both have a color but are plain, pick a tie with a pattern where one of the colors matches the jacket. The general rule is that this should be the dominant color, but you don't have to be so adamantine - so long as a recurring color in the pattern matches, you will be stylish. If the shirt or waistcoat has a pattern, the tie must be in a solid color. Usually, a waistcoat is darker than its matching shirt, so the tie should pick up the color of the waistcoat. This creates a very smart, classic look. If you are not wearing a jacket, tuck a handkerchief that matches the tie in the waistcoat pocket. With just a plain shirt and tie, the color rules are simple - a lighter shirt looks best with a darker tie, and vice-versa. The best ties are always silk, although they come in a variety of fabrics and silk ties themselves come in many weights. As with the rest of your wardrobe, darker and heavier ties are for the colder months or formal evenings, while lighter, brighter ties are worn in warmer seasons and daytime or semi-formal events. You don't want to wear a heavy tie with a shirt in a lightweight fabric. The tie will not sit well under the collar. Likewise, a lightweight or slim tie worn with a shirt in a heavy fabric will get lost on the shirt. Even people who don't have a sharp eye for fashion will be able to tell your look isn't working. If you're in doubt about what sort of shirts can be worn with a specific tie, take the tie to a good men's shop and ask the assistants to advise you - they will be more than happy to do so. Vintage ties, especially the hand-painted ties of the 1940s, are highly sought after by men who like a bit of edge to their style. If you are wearing a vintage suit, you can push the boundaries a bit with bold color choices. However, a vintage tie can also be worn with modern suits for all but the most professional offices. It's best to wear them with very low-key shirts and suits. The tie is the focal point of the outfit. You can add a vintage pin - although be sure to speak to an expert to be sure it won't damage the fabric - but it must match the tie exactly. You should definitely add a matching handkerchief, even with a modern suit. It finishes off the style to perfection. Armed with these tips, you'll always be able to choose the right tie to go with any outfit or suit. 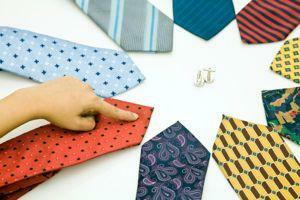 Whether that means searching your closet or shopping at your local men's store, you can select a tie with confidence.